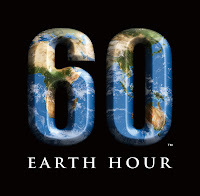 Hours away from Earth Hour in Sydney Australia, many are watching us around the globe. Sign up, and at 7.30 pm switch off and be a shining example (so to speak). Note the huge list of small events. Sydney Australia will switch off the lights at 7.30 pm on Sat 31 March. The planet won't cool much BUT WE WILL SHOW THE WORLD - AND OURSELVES - THAT WE CARE! And what that means is that business will turn more towards providing us with sustainable products and services. In other words, we will move a little bit more towards a world that has a place for our grandchildren's grandchildren. SO SWITCH OFF AND ENJOY THE COOL! And register your commitment with Earthhour. See you there! Maybe not, it'll be dark. Strategy - Where are we really going? If you are starting the day off with your team and you would like to have a guiding thought, you could try "Success" or "Achieve our goals!" or "Fun", even! Or you could try something different. You could think into the distant future that will be created by everything you do (and everything everyone else does) today. And if all of us care about that vision of our common future... Well, you could try "May everything we do contribute to The World We Want for Tomorrow's Child". I hope you will. I will. And if any of this is true then first class facilitation of the Peer group is a way to greatly increase their performance. Peers and Associates - better than staff? It's been argued by some that peers and associates give more useful feedback than direct reports. Feedback about what? Not about how you manage! Upward feedback tells you how you are seen by the people you lead - not by those around you. There's nothing can replace that! Programs of Upward Feedback can lead to lateral or Peer feedback for some groups of managers. In organisations where managers have few reports, you may have to plan for lateral feedback from the start. Small groups wanting to use a Peer profile for each person can use a shorter questionnaire. Larger groups might prefer to use the Team and Self-Management questionnaire. Upward Feedback builds well on prior management training such as Situational Leadership (S/L2) and ensures that it gets used. The continuity of programs ensures that neither of them is seen as just "the latest thing from HR". In 360 feedback, the most effective approach is to have a session just with the team, with its manager out of the room. But what do you do if in working with the team you discover that there are significant tensions and disagreements between them and the manager? Empathy is a powerful means to increased understanding in such a situation. Dave Burton has tried asking the team to sit quiet for a minute or two and empathise with the manager who is about to return to the room. It helps establish rapport in situations where there could otherwise be some discomfort. In a 360 program with the manager out of the room, the process becomes one of overcoming barriers in the team before they can present an agreed response to the manager.